I once read an article that smell is the most powerful sense when it comes to triggering memories. While this surprised me initially, as I thought about it it seemed to be somewhat true. Even though sights and sounds appear to dominate our everyday experiences, smell sure does have a strong connection to memories. I’m sure I’m not the only one who breathes in the scent of fresh pumpkin and is taken back to early days of trick-or-treating, or who takes a whiff of salty, seaweed-y ocean air and remembers long summer afternoons spent at the beach. Taking it one step further, specific foods always bring to mind certain places for me. Cinnamon rolls, for instance, always remind me of the bakery around the corner from my grandparents’ house. Rainier cherries take me back to the tiny general store near one of the campgrounds I frequented as a child, and tomato-cheddar bagels will always be reminiscent of Bagelopolis, a long-gone favorite breakfast joint. M&M cookies go hand-in-hand with Subway in my tangled repertoire of memories. Whenever I went to Subway as a child I always ordered the exact same sandwich: Italian bread with yellow mustard and extra American cheese. No meat, no veggies. Just mustard and extra cheese, emphasis on the extra. Two tiny triangles of that delicious plastic-y white stuff just wouldn’t cut it. I used to get so frustrated at answering the same questions over and over: “I’m sorry, what kind of meat?” “No meat?” “Are you sure?” “No veggies at all?” “That’s it?” No meat. That is correct. Yes, I’m sure. No, no veggies. YES, that’s IT. Since eating at Subway was a special occasion anyway, my parents just went along with it, standing patiently as their children’s sandwiches of choice were wrapped up: mustard and (extra) cheese for their little girl and tuna (no cheese, no veggies, no sauce, JUST TUNA) for their little boy. I always chose Ruffles cheddar & sour cream chips to go with my sandwich, and if my brother and I were lucky we each got to pick out a giant cookie from the tempting glass case next to the cash register. For years, my cookie of choice was always M&M. Who could resist those bright dots of color? Certainly not me! Those soft, chewy, M&M-studded cookies were always the perfect ending to my special lunch (or, if my parents weren’t paying attention, the perfect beginning!) muahaha. I haven’t had a cookie from Subway in years (nowadays I’m one of those boring whole wheat-turkey-every-veggie-you’ve-got-hold-the-cheese people), but making these homemade M&M cookies brought me back to Subway visits long ago, back when I still got a toy thrown into the bag and extra cheese on my white bread with mustard. If I do say so myself, these cookies are even better than the Subway version. They’re much less dry, and stay amazingly soft for several days due to the pudding mix hidden in the batter. They also have the same great chewy texture as their Subway counterparts, especially around the edges. 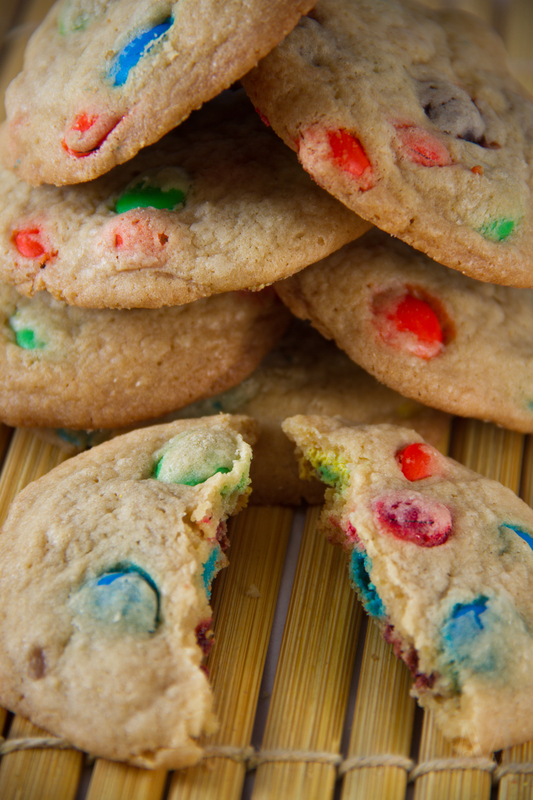 And of course, they’re packed full of M&Ms–the best part! These fun (and delicious!) 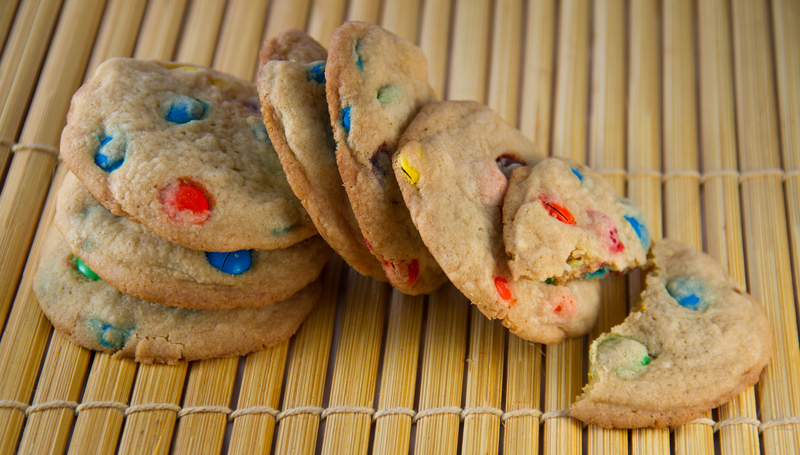 M&M cookies will make you feel like a little kid again, whether you’ve gotten them from Subway or not. 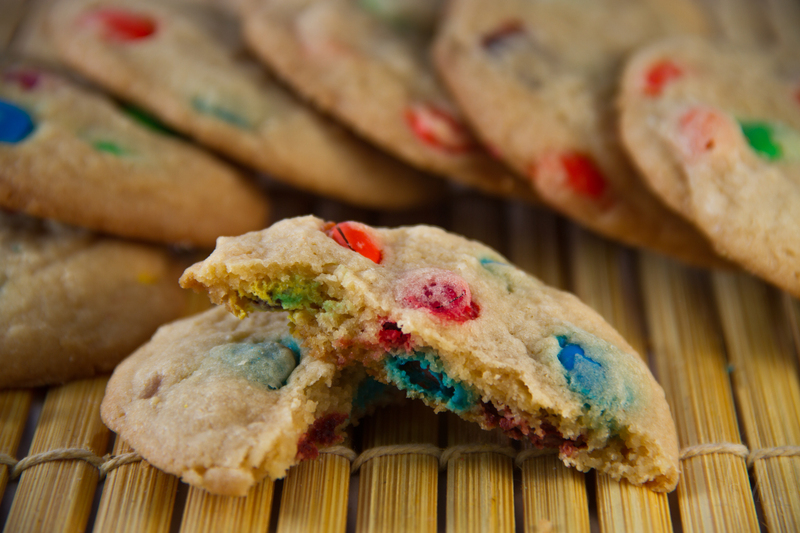 (I’ve been told that M&M cookies can, in fact, be found in other places ;).) Enjoy! In a large bowl, beat together the butter and sugars until light and fluffy. Add in the eggs one at a time, scraping down the bowl as needed. Mix in the vanilla. In a smaller bowl, whisk together the flour, baking soda, and salt. Gradually stir the flour mixture into the wet ingredients, mixing just until incorporated. Stir in 1 & 1/2 cups of M&Ms, reserving the last 1/2 cup. Chill the dough for at least 30 minutes to prevent spreading. When ready to bake, remove the cookie dough from the refrigerator and preheat the oven to 350 degrees F. Line baking sheets with parchment paper or a silicon mat. Scoop the cookie dough into balls (mine were about 1.5 tablespoons each) and place onto prepared cookie sheets. Bake for 10-14 minutes, depending on the size of your cookies, or until the edges are slightly golden and the tops are set. Keeping them on the under-done side will ensure soft and chewy cookies. Let the cookies cool on the baking sheets for 5 minutes, then remove to a cooling rack. Store in an airtight container at room temperature for up to a week. Because Christmas is right around the corner, and because I’ve been doing a ton of baking lately, and because I just feel like spreading a little extra Christmas cheer, today I’m posting TWO delicious cookie recipes that would be perfect for Christmas, Hanukkah, New Year’s, whatever. Delicious Cookie #1, Soft Gingersnaps with White Chocolate Chunks, is basically a soft, moist, slightly chewy, perfectly spiced gingersnap spruced up with white chocolate chunks. The flavor combination of gingerbread-esque spices, molasses, and white chocolate is out of this world! 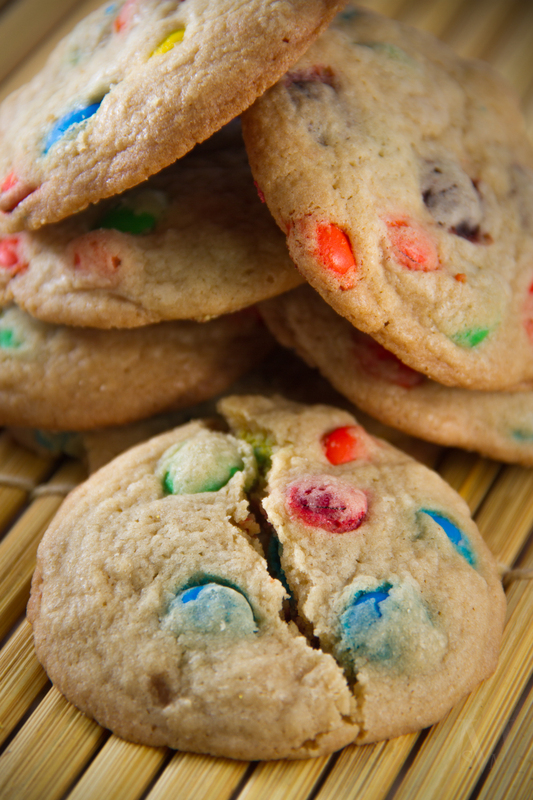 Delicious Cookie #2, White Chocolate Peppermint M&M Cookies, is definitely a must-have for any chocolate-peppermint lover. I just discovered White Chocolate Peppermint M&Ms this year, and they’re amazing just by themselves! They’re even better when baked onto chewy, rich, chocolate-peppermint cookies. Preheat oven to 350 degrees F. Line baking sheets with parchment paper or spray with cooking spray. In a large bowl, beat together the butter and sugar until smooth. Add in the molasses, vegetable oil, vanilla, baking soda, salt, and spices; mix until well-incorporated. Add in the eggs one at a time, beating until smooth. Slowly add in the flour, mixing just until combined. Stir in the white chocolate chunks. Scoop dough by rounded tablespoons, roll in granulated sugar, and place on prepared baking sheets. Bake for 9-12 minutes or until cookies are set but still soft. Let cookies cool on sheets for 5 minutes before transferring to a cooling rack. Store in an airtight container at room temperature. 14 Tbs unsalted butter, melted and cooled to room temp. Using an electric mixer (or a whisk and some elbow grease!) mix together the butter, sugars, cocoa, salt, vanilla, and peppermint extract until smooth. Add in the egg, followed by the egg yolk, beating after each addition. Gradually stir in the flour and baking soda, mixing just until combined. Scoop dough by rounded tablespoons and drop onto lined or lightly greased cookie sheets. 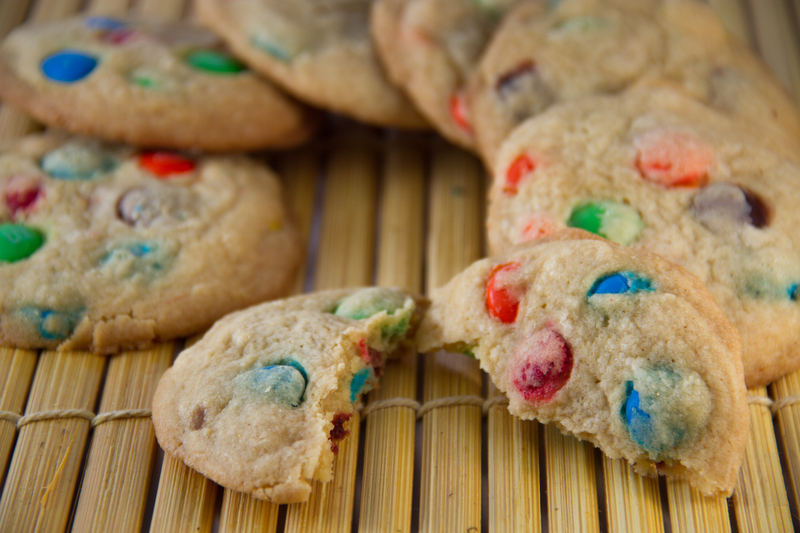 Press 4 or 5 M&Ms onto each cookie (you may have to flatten them slightly). Bake for 8-10 minutes or until edges are set. Let cookies cool on the sheets for 5 minutes before transferring to a cooling rack.